Happy Spring! The birds are chirping, trees are budding, and the sun is shining...or maybe you're still getting snow. Either way, we're in the mood for some Spring crafts! 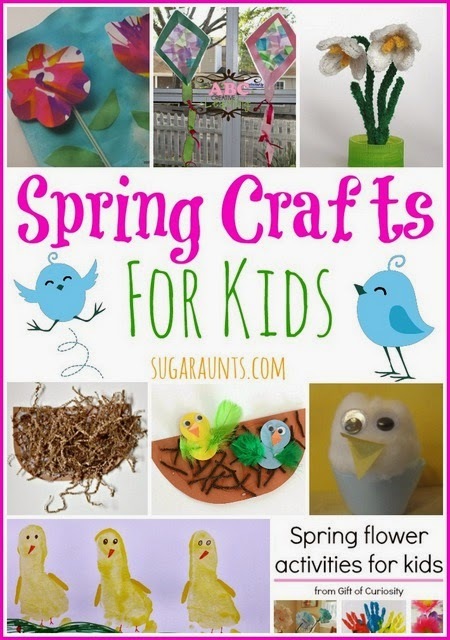 This week's Share It Saturday features are all about Spring crafts. Pull out the glue sticks and get ready to start crafting. These features are super cute and very Spring-y! What says Spring more than a flower craft? We love this pipe cleaner snowdrop flower from Zing Zing Tree. Want more flower crafts? Gift of Curiosity has put together a collection of 8 Spring Flower Crafts. These salad spinner 3D flowers from A Mommy's Adventures are very fun. Spring is all about birds and nests. Get in the Spring mood with this birds nest craft (Buggy and Buddy) or try this birds nest craft (P is for Preschooler). How adorable are these footprint chicks from Frogs and Snails and Puppy Dog Tails? If you're looking for a sun catcher craft, these sun catcher kites from ABC Creative Learning are very fun. We love these cotton ball chicks from There's Just One Mommy for their super cuteness!